Summary: Learn how to fit, install and wire an electric shower. 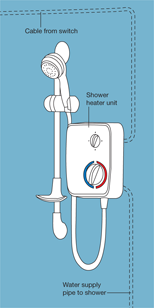 An electric shower is supplied as a wall unit and uses an electric element to heat the water. The unit is plumbed into the cold water supply and is run on a separate circuit to avoid overloading the main circuit. Installation may vary for different shower models so read the manufacturer's instructions carefully. 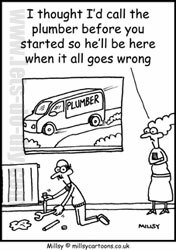 Keep in mind a service like this emergency plumber in case of a problem with your new shower – or any part of your washroom – any time of day or night! Before commencing on the electrical work, install the shower cubicle and tray, and carry out all necessary plumbing work, following the manufacturer's instructions and the guidelines in Installing a shower. Turn off the power to any circuits in the vicinity of the installation at the consumer unit. Ensure all metal pipes and fixtures are properly earthed. Measure the distance between the consumer unit and shower heater to work out how much cable you will need. If the cable route is under 13m and the shower is rated up to 8kW, use 6mm2 cable and a 45amp rewireable fuse. If the cable route is over 13m or the shower is rated up to 10kW, use 10mm2 cable and a 45amp cartridge fuse of MCB. If the route is over 20m, use 16mm2 cable and a 45amp cartridge fuse of MCB. Remove the coverplate of the shower heater and hold it against the wall to mark the position of the fixing holes and cable entry hole. Drill and plug the fixing holes. Also drill a hole at the cable entry point. Prepare the cable route from the consumer unit to the pull-switch on the ceiling, which must not be located directly over the bath or shower cubicle. 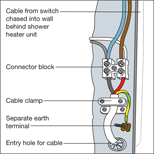 Then run the cable from the pull-switch, along the ceiling and down the wall into the back or base of the shower heater, connecting it to the terminal block inside. Feed the cable connecting the switch and heater into the entry hole in the heater. Fix the heater to the wall with fixings supplied following the manufacturers instructions. Prepare the ends of the cable for connecting to the terminals. 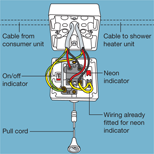 You must use a 45 amp double-pole pull-cord switch with a neon indicator light positioned away from the shower or bath. Press out the tab in the back of the pull-switch base and pull the switch cable from the consumer unit through the hole in the base to reach the terminals in the face-plate. Fix the switch base to the ceiling. To fix it to the side of a joist, drill a hole for the cable to fit through to one side of the joist. Drill pilot holes into the joist and screw on the base through these holes. Alternatively fix the base between two joists, drill a hole in the ceiling. Cut a batten to fit between the joists, and drill a hole in the centre of it. Feed the cable through the holes in the batten and through the hole in the ceiling. Fix the batten to the joists with nails hammered at angles into the joists. To attach the pull-cord, separate the body of the switch with the terminals in from the face-plate. Remove the spindle with on/off markings, which completes or breaks the circuit to control the light or appliance. Thread a washer over one end of the cord and tie a knot at the end. Feed the cord into the nylon peg, which sits in the spring. Push the peg into the spring to secure it. Screw the body of the switch and face-plate back together again. Connect the supply cable running from the consumer unit to terminals in the switch face-plate marked SUPPLY, FEED, or, IN: the red core to the Live terminal (L); the black core to the Neutral (N) terminal; the yellow-and-green core to the Earth terminal (E). Connect one end of the cable leading to the heater to the second block of terminals in the switch face-plate marked LOAD or OUT: the red core to the Live terminal (L); the black core to the Neutral (N) terminal. Connect the yellow-and-green core to the same Earth terminal (E) that the Earth core from the consumer unit cable is connected to. If the two wires for the neon indicator light are not already connected they should be connected to the Live and Neutral terminals marked LOAD or OUT. Screw the switch face-plate to the mounting box. To connect the other end of the switch cable to the heater, undo the screws on the cable clamp to feed the cable underneath the clamp. Inside the shower heater unit there will be a connector block. Live and neutral cores will already be connected to one side of the connector block. Connect the cores from the cable to the opposite side of the connector block: the brown core to the Live terminal (L); the blue core to the Neutral (N) terminal. In place of two Earth terminals on the connector block there may be just a single separate Earth terminal (E) to which the yellow-and-green sleeved core should be connected. Should the connector block have a third terminal for the Earth core from the cable, then it must be connected opposite the yellow-and-green core already connected. Screw the clamp down to secure the cable. Connections inside the shower heater unit. Switch off the power at the consumer unit. Either remove the fuse or turn off the MCB (miniature circuit breaker) you are going to use for the new circuit. With a metal consumer unit knock out the access hole above the MCB you are going to use and fit a rubber grommet. Feed the cable through the hole into the consumer unit. Ensure that you have stripped enough of the cable's outer sheath for the cores to reach the terminals. Connect the cores to the appropriate terminals. The red core is connected to the terminal at the to top of the fuseway or MCB; the black core is connected to a free terminal on the Neutral terminal block; the yellow-and-green core is connected a free terminal on the Earth terminal block. Fit a 45 amp fuse or a 45 amp MCB. The circuit is now complete and the cover of the consumer unit can be replaced and the power restored.